Are you passionate about online marketing, blogging, and social media? Are you an early adopter of new social media platforms? Do your friends look to you on Facebook and Twitter for the newest news (or the funniest memes)? If so, we might be looking for you. 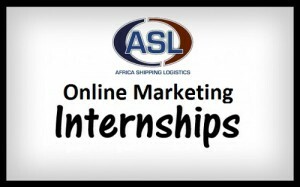 Africa Shipping Logistics is looking for an online marketing intern for the spring semester. This intern’s primary responsibility will be a revamp of our company blog. Through collaboration with the Director of Marketing, the Online Marketing Intern will come up with new blog categories designed to appeal to consumers (such as profiles of stylish social enterprises), brainstorm and write blog entries for these categories, and re-categorize existing blog material to fit the new content structure. This is a unique opportunity for the right candidate – a chance to make a real impact and gain work experience in an entrepreneurial environment! We’re seeking talented interns with a strong desire to learn and the ability to tackle projects head-on. Our ideal candidate is creative and thoughtful about social media and online content creation. You’ll learn valuable skills in project management, online relationship building, and marketing strategies, as well as the tools and software used to implement them. We are looking for an intern who can work 10 – 15 hours a week from our office in Rotterdam, The Netherlands. Compensation can be in the form of academic credit or hourly pay. Assistance in managing company social media profiles such as Facebook, Twitter, LinkedIn, and google+. 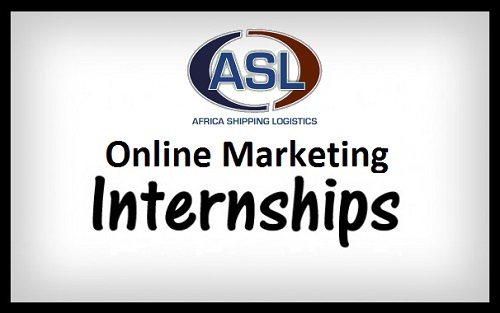 Send your CV and motivation letter to director@africashippinglogistics.com. The email should be received not later than Friday 28Th February, 2014. Any canvassing will lead to automatic rejection of your application.